​As well as the damaging effects that global climate change (temperature, UV radiation, ocean acidification) might exert on the marine biota in the longer term (from decades to centuries), there are more immediate threats to the resident organisms of coastal waters and estuaries from exposure to chemical contaminants, of which metals are a significant component because of their persistence, bioaccumulation and toxic effects. Of the species being affected, the least studied group are the macroalgae (seaweeds), despite their roles as pre-eminent primary producers of near-shore waters, key ‘ecosystem engineers’ providing habitats for a large diversity of other marine organisms, including commercially important shell-fish and fish and significant components of fouling communities on man-made submerged structures such as buoys and hulls of boats. Recent studies from Dr Murray Brown's laboratory have provided valuable information on the effects of elevated concentrations of essential and non-essential metals on different aspects of the biology of seaweeds including significant contributions on cellular, developmental, physiological responses to copper (Cu2+) and cadmium (Cd2+) exposure, in brown algae. However, despite such advances, the underlying mechanisms responsible for metal-tolerance in (brown) seaweeds remain elusive. A major obstacle to understanding the molecular basis for metal (and other) stress responses in seaweeds has been the lack of genomic information. 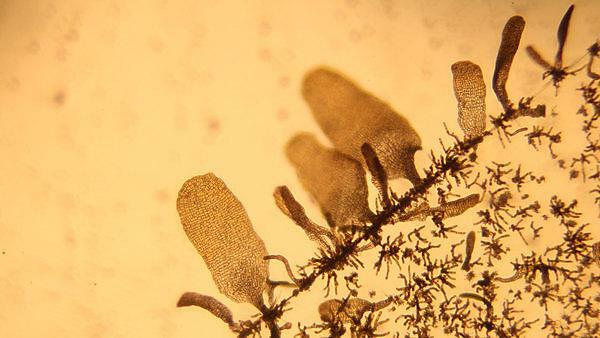 Therefore, with the sequencing of the genome of the biofouling brown alga Ectocarpus siliculosus there is an unprecedented opportunity to investigate the patterns of gene expression in response to metal exposure in this ‘model’ brown seaweed. Our approach is an inter-disciplinary one, combining functional genomics and environmental toxicology and is yielding novel and exciting information on the molecular mechanisms underlying key aspects of the responses to metal stress in brown seaweeds, a group with global economic and ecological importance. The ability of photosynthetic organisms to maintain cellular concentrations of essential metals within physiological limits and minimize the detrimental effects of non-essential metals requires a network of mechanisms that control accumulation, uptake, trafficking and detoxification. One mechanism we are investigating is the intracellular chelation and sequestration of metals by ligands. The two best characterised in plant cells are metallothioneins (MTs) and phytochelatins (PCs). Phytochelatins are small sulphur-rich oligopeptides of the general structure (Glu-Cys)n-Gly, n = 2-11 that are synthesised through two enzymatic pathways, the synthesis of a tri-peptide molecule Glutathione (GSH), and the conversion of GSH to PCs by Phytochelatin Synthetase. We have recently published results confirming the presence of PCs in natural assemblage of seaweeds, including brown seaweeds belonging to the genus Fucus, and our current research has shown that the quantity and size of PCs in Ectocarpus is related to exposure concentrations. Furthermore, we’ve also found that the expression of genes encoding key enzymes for the synthesis of PCs varies between populations of E. siliculosus collected from locations with different histories of metal pollution. As well as providing interesting insights into the evolution of metal tolerance in this group of organisms, our findings have the potential to be used for developing molecular and biochemical markers for the early detection of metal pollution in coastal and estuarine systems. Chile, with a shoreline of 6435 km, is one of the most biologically productive temperate marine macro-ecosystems in the world. The Humboldt Current combined with upwelling processes provides constant nutrient exchange which supports high coastal biodiversity including kelps that are the foundation for and bioengineers of food webs. Human habitation and industrial activity along the length of the country have negatively impacted these coastal ecosystems. Anthropogenic inputs of metals, mainly from mining activities, are the priority pollutants; metal stress disrupts marine communities, and represents a threat to human health as consequence of the consumption of metal contaminated resources. Supervised by Dr Murray Brown, Claudio Sáez Avaria’s PhD research takes a multidisciplinary and holistic approach to marine pollution through his investigation of the mechanisms the model brown alga, Ectocarpus siliculosus, has developed to counteract the effects of metal stress at different levels of biological organization with special emphasis in molecular and biochemical aspects. Using several cultured strains of E. siliculosus in environmentally controlled laboratory experiments, Claudio is assessing the oxidative stress defence responses to copper and cadmium metal exposure by measuring different antioxidant, redox enzymes, metal chelators, and the expression of important genes involved in metal stress response. Although the latter can provide valuable information on specific metabolic responses against metal stress, they do not necessarily represent the mechanisms by which algae respond in natural, more complex, environments. As a recipient of a Santander Postgraduate Mobility Support Scholarship, Claudio will travel to Chile and perform transplantation experiments in metal polluted and non-polluted sites, in locations where some of the cultured strains originated. Due to the global distribution of Ectocarpus in temperate latitudes, the data generated will be used to evaluate this seaweeds suitability as a bioindicator of metal pollution. This data will also aid in the development of reliable biochemical and molecular biomarkers for assessing the health status of the coastal environment. Claudio’s field research in Chile will strengthen research links between Plymouth University and Valparaiso University and Catholic University of the North, both located in Chile as well as build on existing links with academic institutions located in Italy, France, New Zealand and the UK. Sáez, C.A., Lobos, M.G., Macaya, E., Oliva, D., Quiroz, W., Brown, M.T.. Variation in patterns of metal accumulation in thallus parts of Lessonia trabeculata (Laminariales; Phaeophyceae). Implications for biomonitoring. PLoS ONE (under review). Sáez, C.A., Pérez-Matus, A., Lobos, M.G., Oliva, D., Vásquez, J.A., Bravo, M., 2012. Environmental assessment in a shallow subtidal rocky habitat: Approach coupling chemical and ecological tools. Chemistry and Ecology 28, 1-15.